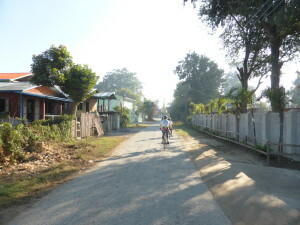 We rode through the morning mist along back roads down the Eastern shore of Inle Lake this morning. It felt very exotic and Eastern as temples appeared through the haze with people doing their washing in the nearby streams. It was a great ride past schools where kids shouted out to us; past people eating their breakfast on tables set up beside the path; past a bullock cart plodding creakily along; past farmers chopping sugar cane; past monks returning to the monastery with their morning alms. Our ride ended with a snack beside the lake and then a walk out over an endlessly long jetty to meet up with our boat. Like much of the Lake surrounds the area was covered with floating tomato plantations. The locals literally build up lozenge-shaped floating islands which the anchor in place with long poles and plant with tomatoes. Inle Lake is not deep and the boats are all long and thin with propellers that barely cut the surface and leave a rooster-tail of wake behind them. It was still early enough that there was haze on the water and amongst it many, many locals out fishing. 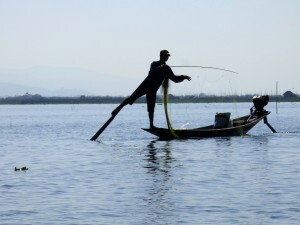 The locals fish standing on the rear of their boat and controlling the boat with a single paddle they hold under their arm, leverage off their hip and then move with their leg. It looks like it takes incredible balance. 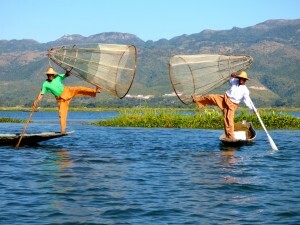 The traditional method of fishing used a conical net, but today the fishermen lay long nets between poles and then hit the water to scare fish into the net. We motored down to the Southern end of the lake where there are a series of villages. Our first stop was a silversmiths which provided a great insight into how silver is refined and made into jewelry. With this, like several others stops around the Lake, we had absolutely no way to judge how genuine what we were seeing was – but it was interesting and they really were working silver even if most of what was available in their shop was probably made elsewhere. Our next stop was one of the three most famous temples in Myanmar. In the centre of the temple there’s a raised dias on which sit five large, rounded, lumpen gold objects. It turns out that this is what you get when you take five statues of Buddha and spend decades adding gold leaf. Now the smallest of the statues is basically a sphere and the others look like golden snowmen. 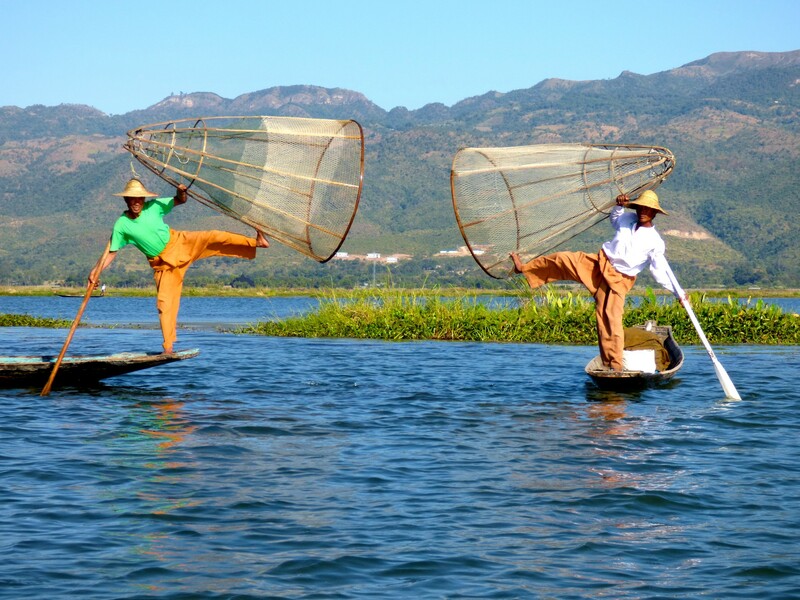 Inle Lake fisherman – for the show. In the markets outside the Temple, Declan negotiated for a little articulated silver fish which he is delighted with. From the temple we walked to lunch through a residential area and to the backing noise of the most incredibly loud music. There was a ceremony on the river to welcome new novice monks and the richly-decorated boats involved had enormous loudspeakers up the front, like over-sized old-style car horns, blaring out music at an amazing level. Each boat its own music, creating the most amazing wall of sound. After lunch we visited a weaving factory and a blacksmith, and then motored further North to visit a lovely temple known for its jumping cats. Well, actually it isn’t, someone put that in Lonely Planet and now even the locals are calling it the Jumping Cat Temple. Finally we headed on back home past yet more tomatoes and fishermen, including a few who we could only think we fishing for tourists rather than anything with fins. I’m sure a chunk of today was fake, but there was no faking the real fishermen, the people washing at the side of the lake, the kids waving at us, or many of the other wonderful things we saw.